Ram Prasad Bismil (Hindi: राम प्रसाद 'बिस्मिल') was an Indian revolutionary who participated in Mainpuri Conspiracy of 1918, and the Kakori conspiracy of 1925, both against British Empire. 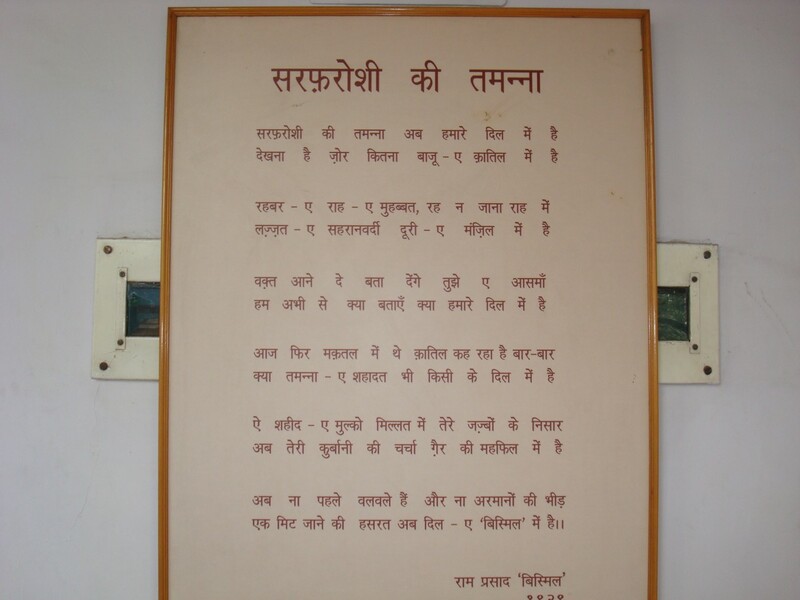 As well as being a freedom fighter, he was also a patriotic poet. Ram, Agyat and Bismil were known as his pen names which he used in Urdu and Hindi poetry. But, he became popular with the last name "Bismil" only. He was associated with Arya Samaj where he got inspiration from Satyarth Prakash, a book written by Swami Dayanand Saraswati. He also had a confidential connection with Lala Har Dayal through his guru Swami Somdev, who was a renowned preacher of Arya Samaj. Rama Prasad was born at Shahjahanpur in Uttar Pradesh in 1897. His ancestors belonged to the Thomarghar area of Gwalior State. His village was situated adjacent to the British administered provinces on the banks of the river Chambal. People of the Chambal valley are fearless, sturdy and brave. For generations several states had tried to establish their dominance over them but failed. Ram Prasad’s father Muralidhar was a simple man. He had only a little education and was employed in Shahjahanpur Municipality. He was tired of service and switched over to an independent life. He began to lend money on interest and hired out carts for his livelihood. His first son lived only for a few days and then expired. Ram prasad was his second son and so darling of his family. In his seventh year his father started teaching him Hindi. He was also sent to a Moulvi to learn Urdu. Later he was sent to a school. He was fourteen years old by the time he completed the fourth standard in Urdu. By then the habit of reading Urdu novels had taken hold of him. He needed money to buy the novels, but his father would not give him money. So he started stealing money from his father’s safe. He had also learnt smoking and occasionally he even used bhang (charas). As a result he failed twice in the fifth standard. As his father came to know about his habits of stealing he got the lock of the safe changed. Ram Prasad expressed his desire to join an English school. His father did agree first but his mother’s support enabled him to join an English school. Once a priest came to the temple near his house. He took a liking for young Ram Prasad. Under his healthy influence Ram Prasad gradually gave up the bad habits he had cultivated. He also learnt the rituals of worship. At school,too,he found a good friend Sushil Chandra Sen and gave up smoking under his company. A gentleman by name Munshi Indrajeet once saw young Ram Prasad performing worship and was very much pleased. He taught Ram Prasad’ Sandhya- vandana’ (the traditional prayers). He described him the deals of Arya Sarmaj. Ram Prasad read the Sathyartha Praksha’ by the great sage Swami Dayanand. This book influenced him deeply. Realizing the importance of Brahmacharya , Ram Prasad practiced it in word and spirit. He gave up the evening meal. He also gave up savory and sour dishes and use of salt. The practice of Brahmacharya and regular exercises made his face radiant and his body strong as steel. At that time, Swami Somadevji, a leader of the Arya Samaj, came to Shahjahanpur and stayed there to improve his health. He was very weak because of loss of blood. Young Ram Prasad devoted himself to the service of Swami Somadevji. Swami Somadevji was proficient in Yoga too. He suggested some good books for Ram Prasad to read. Under his guidance Ram Prasad’s views on religion and political subjects grew clearer. In the year 1916, Bhai Paramanandji was sentenced to death in -the Lahore Conspiracy case. He had written a book with the title’ Thavasi q Hindu’. Ram Prasad read the book and appreciated it immensely. He came to admire Paramanandji. When he heard about the death sentence, his blood boiled and he took a vow that he would settle scores with the British Government for this great injustice. He told Guru Somadevj i about his vow. The Guru remarked, “It is easy to take a vow but hard to keep it.” Then Ram Prasad touched the feet of Guru Somadevji and declared, “if have the grace of these sacred feet my vow will surely be fulfilled; nothing can come in the way. “This was the first step in the revolutionary life of Ram Prasad. After some time Guru Samadevji passed away. Ram Prasad had come up to the ninth standard. He was active as an enthusiastic volunteer in the Shahjahanpur Seva Samithi. The Indian National Congress was to have its annual session at Lucknow. There were two groups in the Congress at that time. One group consisted of liberals, who were opposed to any direct action against the British Government the other group was that of extremists who believed in fighting the British Government and attaining full independence. Lokamanya Bal Gangadhar Tilak was their leader. Tilak was expected to participate in the session and so the extremists had gathered in large numbers. Ram Prasad also went to Lucknow. The liberals were in a majority in the Reception Committee. They had not made any elaborate arrangements to welcome Tilak. He was just to be received at the railway station. But the young men desired that Tilak should be taken in a procession through the city. With a student of the M. A. class as their leader they gathered at the rai1way station. As soon as Tilak got off the railway carriage, the volunteers of the Reception Committee surrounded him and took him to the waiting car. The M.A. student and Ram Prasad leaped forward and sat in front of the car. “If the car is to move, let it move over our bodies,” they declared. The members of the Reception Committee and Tilak himself tried to dissuade the~but they didn’t budge. Their friends hired a coach, set free the horses and then drew the coach. Tilak was made to sit in the coach and taken in a procession. All along the way flowers were showered on Lokamanya Tilak. 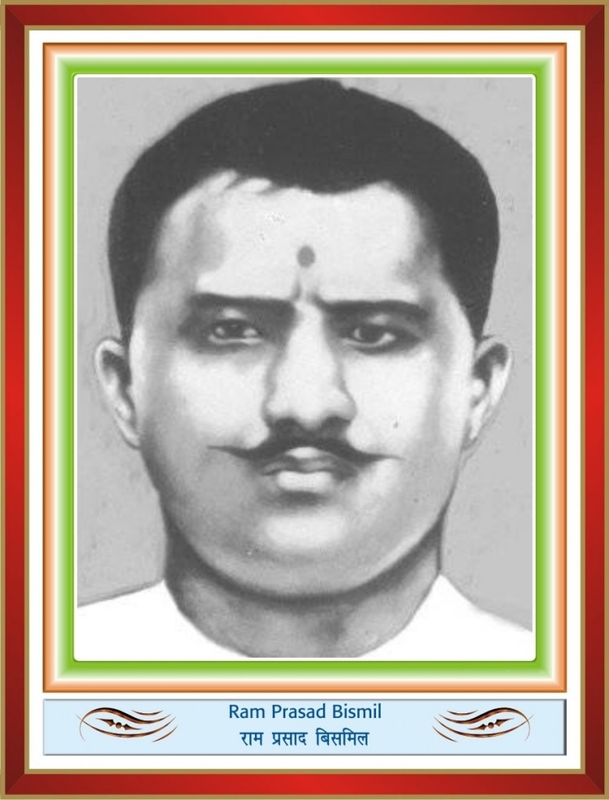 Ram Prasad Bismil was a brave revolutionary who gave up his life smilingly for the sake of the Motherland. He was persecuted by an enraged foreign government, hunted by the police and betrayed by follow workers. And yet he lit the fire of revolution to bum down the slavery. He was the brave leader of the Kakori Rail Dacoity episode. His poetry is also a lamp lighted at the altar of the Motherland. Kakori is a village near Lucknow. It became famous because the attack on the train took place nearby. It was the evening of the 9th of August 1925; the number eight down train was passing near Kakori. Ram Prasad and his nine revolutionary followers pulled the chain and stopped it. They looted the money belonging to the government, kept in the Guard’s carriage. Excepting that one passenger was killed by an accidental shot, there was no bloodshed. This extremely well planned dacoity shaked the British government. After a month of detailed preliminary inquiries and elaborate preparations the government cast its net wide for the revolutionaries. Arrest warrants were issued not only against the ten participants but also against other leaders of the Hindusthan Republican Association. With the lone exception of Chandrashekhar Azad, all participants were caught. The case went on for over a year and a half, Ram Prasad, Ashfaqullah, Roshan Singh and Rajendra Lahiri all four were sentenced to death. 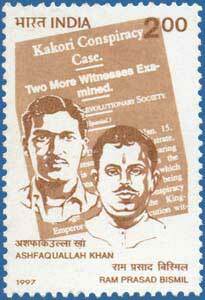 A strong campaign was organized throughout India to save the lives of these revolutionary heroes. All the leaders of public life appealed to the British Government to .show mercy to the condemned men. But the Government was unyielding. It was the 18th of December 1927. A middle-aged lady was waiting at the main gates of the Gorakhpur Central Jail. Her face was radiant but anxiety was writ large on it. She was eagerly waiting to be called into the prison. By that time her husband also arrived there. He was surprised that his wife was there before him. He also sat down to wait for the call. Another young man came there. He was not related to them. He knew that the couple would be permitted to enter the prison.But how could he manage to enter? This was his problem. The officials of the prison called in the husband and the wife. The Youngman followed them. The guard stopped him and rudely asked, “Who are you?” “Permit him also, brother. He is my sister’s son”, the lady said in an entreating voice. The guard relented. The brave son of that brave mother was Ram Prasad Bismil. He was the leader of the famous Kakori Rail Dacoity case.The last meeting ended. Next morning Ram Prasad got up earlier than usual, bathed and said his morning prayers. He wrote hi last letter to his mother. Then he sat down with a calm mind awaiting his death.The officials came and removed his chains. They took him from the prison cell-towards his death.He was completely untroubled and walked like a hero. The officials were amazed. As he moved to the gallows he joyfully chanted ‘Vande Matharam’ and ‘Bharat Matha ki Jai’. At the top of his voice he shouted down with the British Empire.” Then he calmly recited prayers like ‘Vishwani deva savithahadunithani .... And embraced death. As he was being executed, there was a strong guard around the prison. When he was dead the officials brought out the dead body. Not only his parents but also hundreds of his countrymen were waiting in tears. he was a great worrier and freedom fighter. he fought bravely against ruler of the nation. we salute him.